Plans to exhume Padre Pio - one of Italy's most popular saints - on the 40th anniversary of his death have been attacked by relatives and followers. Church authorities say they want to display the body for veneration by the faithful for several months from April. But Pio's relatives have threatened to take their local bishop to court if the corpse is removed from the church crypt in San Giovanni Rotondo in south Italy. The Franciscan monk was canonised by the late Pope John Paul II in 2002. Saint Padre Pio was credited with thousands of miraculous cures during his lifetime, and 40 years after his death he is still venerated as a miracle-worker. His image is displayed in homes, shops, garages - even on the backs of trucks - in many parts of Italy. The bishop of San Giovanni Rotondo announced at the weekend that the corpse would be exhumed and put on display for several months in the town where he spent most of his life. This caused outrage among some Padre Pio followers, who are threatening to take the bishop to court to prevent the body being removed from its resting place. 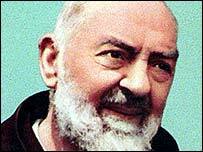 Padre Pio's canonisation in 2002 attracted to the Vatican one of its largest crowds ever recorded. The archbishop says he has the Vatican's permission for the exhumation, but a lawyer for the saint's niece, who is also the head of an association of Padre Pio devotees, says he will do anything necessary to stop what he regards as a profanation of the remains of the monk. The hands of the saint, who lived to the age of 81, often bled copiously. His followers said he bore the wounds of the crucified Christ.